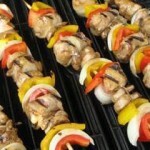 Delicious, easy, low carb chicken kebabs- perfect for summer barbecues! Cover and place in the fridge to marinate for at least 2 hours to overnight- the longer the better! If you don't have a grill, you can easily make these using the broiler in your oven.